Urban, vintage, and bohemian blend together to create a multi-textural blend of navy blue and teal. Monochromatic color allows the nuances of materials and techniques stand out. Avant Toi is known for their experimental use of texture and processes. The Avant Toi turquoise linen cardigan has textural material and dye, while the scarf has silk print and mixes fabrics with cashmere. Jaga brings a familiar artsy and sensual quality with hand-painted silk shirt. 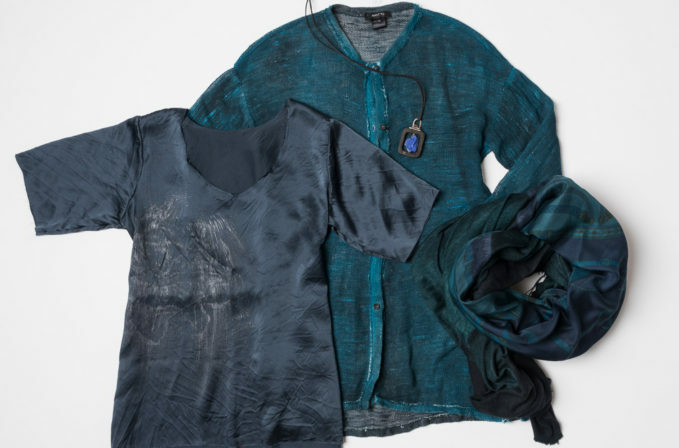 The richness in the clothing is reminiscent of age that is found in the natural textural in Lou Zeldis lapis necklace.